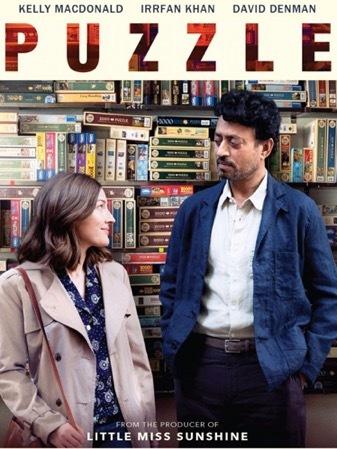 PUZZLE is a closely observed portrait of Agnes, who has reached her early 40s without ever venturing far from home, family or the tight-knit immigrant community in which she was raised by her widowed father. That begins to change in a quietly dramatic fashion when Agnes receives a jigsaw puzzle as a birthday gift and experiences the heady thrill of not only doing something she enjoys, but being very, very talented. What’s your favourite scene or line from the movie? Which puzzle in the movie is most intriguing? Which observation of Robert about Agnes seems most significant? Agnes and Robert seem worlds apart culturally, yet how are they similar? Does Louie evoke any sympathy in you? Why or why not? Agnes seems to awaken considerably, yet the ending begs for more narrative. How do you imagine the next puzzle pieces falling? Which puzzle-like passion or pastime enlivens your life? Which Scriptural text or wisdom story does the movie evoke? Defaulting to conventional social roles is easy yet dangerous. How do you keep from falling into them? How does the movie speak to you about vocation or challenge your understanding of vocation?